RCCDSB students were soaking up more than sunshine in summer school programs in July. They were expanding their literacy and numeracy skills with lots of fun adventures and active learning activities at schools across Renfrew County. “Teachers incorporated cooperative and active learning principles in the summer programs, with the arts or religion, science, history, geography and social studies themes,” said Principal Jody Weller, who led the programs in the Renfrew, Arnprior and Madawaska areas. “The overall focus was to integrate literacy and numeracy activities in a fun and interactive way to engage students,” Weller said. Literacy activities stretched from read-alouds and shared reading, to independent reading and writing activities. To expand numeracy, students played an assortment of games, including Thirty-One, Yahtzee, Monopoly, Clue and Chess, among other things. St. John Bosco Catholic Elementary School in Barry’s Bay offered summer classes for Senior Kindergarten to Grade 7 students, including students from St. Mary’s in Wilno and St. Andrew’s in Killaloe. An afternoon summer recreational camp was also held at St. John Bosco from July 13 to 17, for students up to Grade 3. Activities included a trip to Frontier Trails Camp and Outdoor Education Centre. St. James Elementary School in Eganville offered classes for Senior Kindergarten to Grade 6 students, including students from St. Michael’s in Douglas. In Arnprior, St. Joseph’s Elementary School offered classes for Arnprior-area students up to Grade 8. St. Joseph’s also offered a high school credit recovery class for St. Joseph’s Catholic High School students from the Arnprior area. Meanwhile, St. Joseph’s Catholic High School in Renfrew offered summer school to students up to Grade 7. In Petawawa, Our Lady of Sorrows Catholic Elementary School offered Senior Kindergarten to Grade 6 classes for students from Petawawa, Deep River and Chalk River, while Holy Name Catholic Elementary School in Pembroke provided Senior Kindergarten to Grade 6 classes for students in the Pembroke and Westmeath area. Holy Name also held an afternoon recreation camp for students up to Grade 3 during the week of July 13 to 17. Activities included a trip to the Best Western Fitness club for an interactive Drums Alive activity. Meanwhile, Bishop Smith Catholic High School in Pembroke offered a credit recovery program, allowing students to recover course credits they had missed during the school year. An online Grade 12 religion credit course, HRE4M, also was provided at Bishop Smith, as well as an Individual and Family Living Grade 9 credit course, called HIF 10. 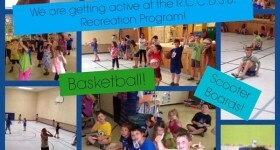 New to summer school this year was a recreation program for Kindergarten to Grade 3 students. The program operated at Holy Name Catholic School in Pembroke and St. John Bosco in Barry’s Bay, and was a big hit with students who participated in both indoor and outdoor activities such as basketball, yoga, dance water fun and tennis. Two big events during the summer were the popular summer camps for Grade four students held at St. Joseph’s High School in Renfrew and Bishop Smith in Pembroke. The Crusader Camp was held at Bishop Smith from June 29 to July 3 with 67 participants. St. Joseph’s held its Jaguar Camp from July 7 to 10, with 55 participants. Activities in both camps included HILA science workshops with fun experiments, such as using lemons to conduct energy, as well as organized sports and games, drama and music activities, and 21st Century Learning Skills using Destination Imagination activities. Healthy snacks were served daily with a pizza party for all participants on the last day!